Your choice, but you will see the difference, hear the compliments, and feel more confident with the right tools. These seven tools will make you sculpt better or your money back. Thats right return them for a full refund within 60 days if they do not improve your miniature sculpting. I hand make all these myself. Each tip is hand forged. 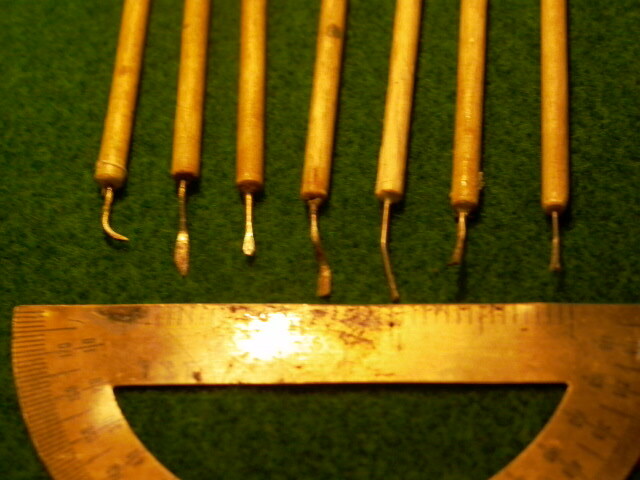 Then I make the handles out of dowel pins, sand and stain them either dark maple or golden oak. The color is your choice. Fine paint brushes - go to your local art store. A picture of my hand made tools. They will help your sculpting or your money back. If you want more pictures you will have to e-mail me and request them. I have limited space for pictures, and I save it for my furniture & bits. I do not like to break up the sets, so I charge more for a single tool. Send me an e-mail for any questions you may have.